Nitol Paaye Lyrics from Prem Amar 2 Bengali Movie. The Song Is Sung by Imran Mahmudul. Featuring: Adrit Roy, Puja Cherry Roy And Sourav Das. Music composed by Fuad. Nitol Payer Rinik Jhinik Bangla Song Lyrics written by Fuad. Mixed and Mastered by Subhadeep Mitra. 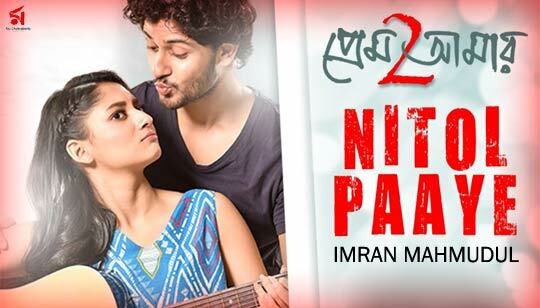 News About Nitol Paye Song Lyrics In Bengali from Prem Amar 2 Bangla Movie. Song Is Sung by Imran Mahmudul. Originaly This Song Is Sung by Fuad. Music Recreated by Savvy Gupta. Programming and Guitar by Kuntal De. Screenplay and Dialogue by Arpita Roychoudhury.